Garbiñe Muguruza, the 14th seed celebrates victory with the trophy after beating Venus Williams in the final of the Women’s Wimbledon Title. Venus Williams could not match 23-year-old’s high-energy performance, who has only lost her serve four times. 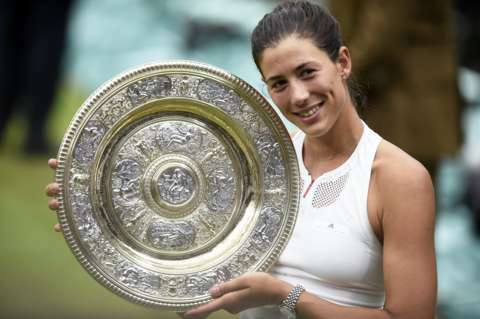 Muguruza beat Venus Williams in their first meeting on grass 7-5 6-0 as the Spanish 14th seed emulated her coach Conchita Martinez’s memorable triumph in 1994 and made up for her own pain of losing to Serena Williams two years ago to lift the Venus Rosewater Dish. Back in the All England Club final after an eight-year absence, Williams, 37, was hoping to become both the oldest Wimbledon and major winner since the Open era began in 1968 but was unable to claim a sixth Wimbledon title as Muguruza’s power proved too hot to handle. Under the Centre Court roof, it was Williams who turned the screw with some sublime groundstrokes to earn two set points. But the Spaniard held steady following a tumultuous 19-shot rally to come through under immense pressure. And Muguruza made Williams pay for her error with a break in the 11th game before delighting her temporary coach for Wimbledon, Conchita Martinez, by holding an intensely physical service game to take it 7-5 after 51 minutes of action. The second set was almost a formality for the Spaniard, with Venus literally running out of steam. In the second Muguruza drove on to win 7-5, 6-0 in an hour and 17 minutes. Although, there was an unspoken concern that the final might be a disappointment, an anticlimax because of the overload of emotion attached to it. Venus had been in a curiously downbeat mood after beating Konta in the semi-finals, and Muguruza was edgy in her post-match dealings with the media. But this game didn’t disappoint, the atmosphere was brilliant and the match was entertaining.